The Prairie Evolution from Goldacres will meet spraying needs with the highest efficiency. The heavy duty designed chassis is manufactured for a long service life tackling the toughest of conditions. With the walk through front platform, the Prairie is perfectly matched to the new TriTech boom, with its new wider centre section, for the ultimate in boom performance. 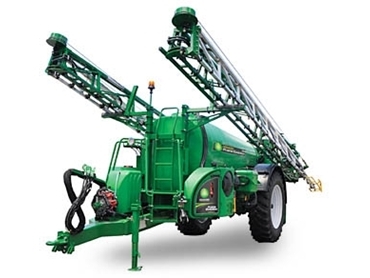 With Goldacres EZ control station, sprayer operation is made easier as all functions are in one location directly next to the quick fill point and induction equipment. Protected by a steel cover when it’s not in use, the EZ control uses 6 flip valves and 2 rotary ball valves to control up to 12 filling and pressure functions. The narrow profile drawbar has a 360° rotating hitch and integrated drawbar connection arm that when making tight turns keeps everything out of the way. The choice of wheel track widths and airbag suspension options give you the chance to customise the Prairie to suit your needs. Ultraglide, Smartsteer and direct chemical injection options can be fitted to the Prairie to improve the safety and maximise the spraying efficiency.